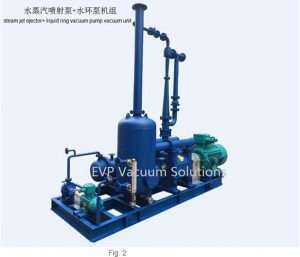 Vacuum system of vacuum distillation plant- Vacuum Pump - EVP Vacuum Solution! (4)The operation of the vacuum system is environmentally friendly. (1)There are not many vacuum pumps capable of pumping water vapor and various materials, mainly jet vacuum pumps, water ring vacuum pumps, wet Roots pumps and cryogenic condensing pumps. (2)Reciprocating pump, slide valve pump, rotary vane vacuum system and Roots vacuum pump required to be configured in front of the trap, you can extract a certain amount of steam These mechanical vacuum pump configuration Gas valve and oil-water separator can extract a small amount of steam, But not suitable for use in vacuum distillation equipment. 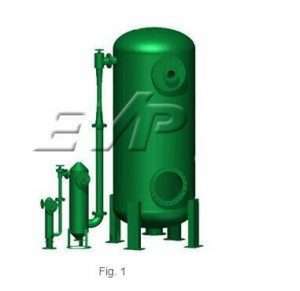 e.Generally the working steam pressure is 5X105 Pa ~ 15X105 Pa Pa. In the last stage of the steam jet pump unit (directly into the atmosphere) into a water ring pump, which is characterized by quick start, saving steam consumption, reducing operating costs, other performance and water vapor jet pump unit basically the same . 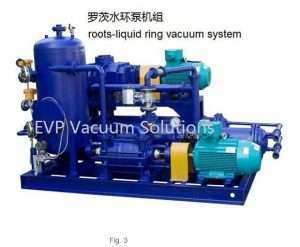 Roots-based pump vacuum unit can be divided into Roots pump + water ring pump to form Roots ring pump unit; Roots pump + wet Roots pump, the composition of the two types of pure Roots pump unit. Roots pump unit of the vacuum is relatively high, can be pumped from the atmospheric pressure to 10-2 Pa, pumping rate is smaller than the water vapor jet pump, the maximum pumping speed of the Roots pump up to 20000 L / s. Roots pump unit The failure rate is higher than that of steam jet pump unit, the capacity of pumping steam is small, and the Roots pump unit has fast pneumatic operation. The above pictures are designed by Shanghai EVP Vacuum Technology Co., Ltd. Based on different customer’s requirements in their vacuum distillation plant. Just for your reference. If you have any interest or have such requirements, please directly contact us. Thank you.